Millions watched as Nik Wallenda walked a tightrope across a windy gorge near the Grand Canyon. Up next: his own baseball cards. 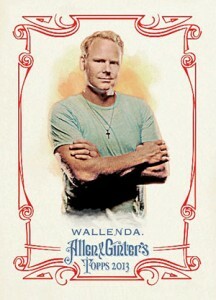 Wallenda is slated to appear in the upcoming 2013 Topps Allen & Ginter Baseball. The set is popular for mixing current and retired baseball players alongside "champions" from other realms. These can be other mainstream sports and others that are on the fringes. Past non-baseball subjects have ranged from college basketball coach Bob Knight to hot dog eating champion Takeru Kobayashi to Sports Illustrated Swimsuit Issue cover girl, Kate Upton. Monster trucks and champion dogs have also made the cut. Besides having a card in the main set, Nik Wallenda also has autographs and relic cards randomly inserted in packs of 2013 Topps Allen & Ginter. The relic cards have a piece of memorabilia provided directly from the high-wire walker. Wallenda's trek across the Little Colorado River Gorge, which is located close to the Grand Canyon, was done without a net or harness. The rope was about 1,500 feet in the air. Adding to the danger were strong gusts of wind. It took Wallenda 22 minutes to cross the 1,400-foot long wire. The entire thing was broadcast live on Discovery Channel. Wallenda holds numerous world records, including one for crossing Niagara Falls. 2013 Topps Allen & Ginter Baseball is scheduled for release in early August. Circus Performer Nik Wallenda Bobblehead! Numbered 184 Out Of 1000!! !